Go to Marketing > Lead Sources. If this is a sub-category of another source select the parent lead source ID. The checkout option is now obsolete. Lead courses can be assigned to both contacts and orders. An order will inherit the lead source from the contact it is created against. 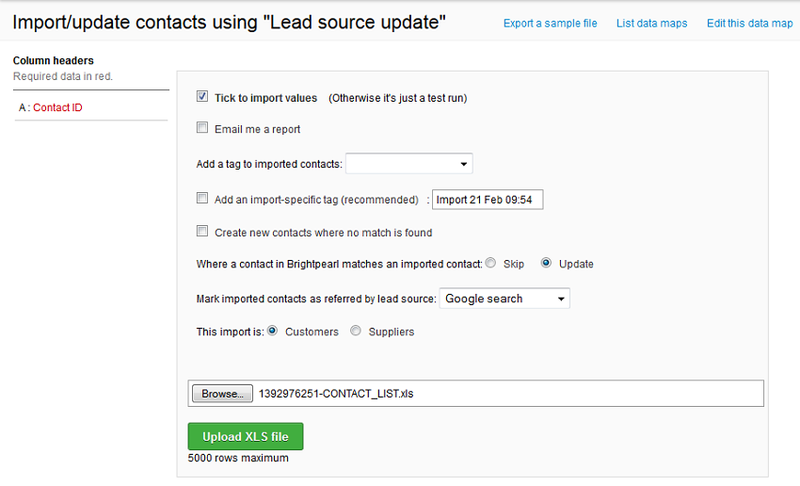 Contacts created via a SmartForm can be automatically assigned a lead source. Orders can be manually assigned a lead source directly or in batches from the sales list. Lead sources will automatically filter through to any accounting transactions created for those orders. Note that you will need to update the column header in the file from "Contact" to "Contact ID". All the other columns in the exported Excel file can be deleted. Each accounting transaction (e.g. bank payments, purchase invoices) can be allocated to a lead source. In a similar fashion, any sales or purchase orders can be assigned to a lead source using the drop-down menu in the "other/payment info" tab. This allows you to accurately track your spend on each lead source and the resulting business that it generates. The Profit and Loss report can be filtered by lead source. It is not possible to edit a lead source, but they can be deleted, so to change a lead source we suggest exporting the contacts as a record then deleting the lead source, adding a new one and then updating those contacts to have the new lead source. Delete the lead source and then re-add it with the corrected name.